Mobile Hotel Websites: Does Yours Pass the Test? Back in 2015, Google began to use the mobile-friendliness of a website as a ranking factor. Web pages that looked great on both desktop and mobile devices began to rank higher in the search engine. Fast forward to today and mobile hotel websites are doing better than ever, becoming a mandatory component of hotel SEO. Google is a business and is always working to provide the best experience possible to its users. If a user on a smartphone is searching for a hotel, you can be guaranteed that Google won’t send them to a website that doesn’t look great on their device. Over half of online travel bookings are now made on mobile devices, and this is expected to grow to 70% by 2019. Hotel websites that aren’t optimized for mobile devices are literally leaving money on the table, especially given the amount of investment made by Online Travel Agencies to create a great user experience. What we are finding however, is that while large chain hotels, airlines, and online travel sites are continually optimizing their websites for mobile bookings, many independent and boutique hotels are dragging their heels. Over half of online travel bookings are now made on mobile devices, and this is expected to grow to 70% by 2019. After the initial mobile-friendly update, many savvy hotel marketers quickly adapted their existing websites to use responsive design. When a larger ranking boost was given to mobile friendly websites, we saw those planning ahead reap the rewards, receiving a greater share of organic search traffic for users on mobile devices. 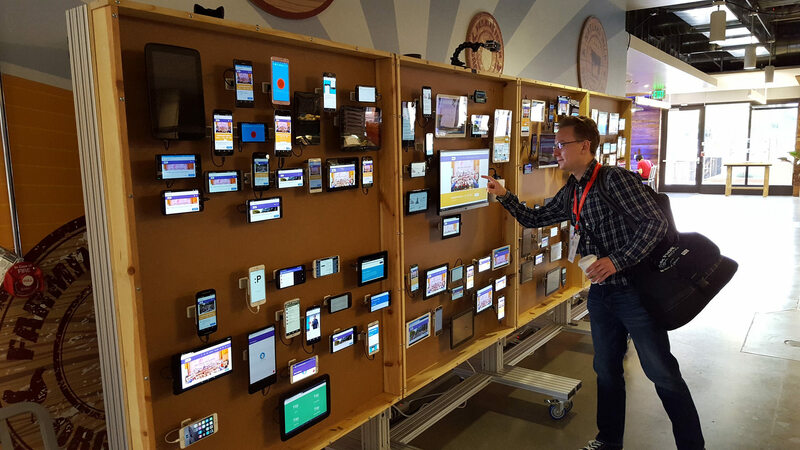 Late in 2016 though, Google published their intentions to use “mobile-first indexing”, regardless of whether the user is on a mobile or desktop device. For anyone wondering, Bing are doing the same. This means your hotel’s website can look incredible on a desktop computer, but if it looks bad on mobile, it’s not going to be on page 1 in Google. Google’s preferred method of making a website mobile-friendly is to use responsive web design – allowing desktop webpages to be viewed in response to the size of the device the user is browsing the website with – mobile, tablet, laptop, desktop and even larger screens. 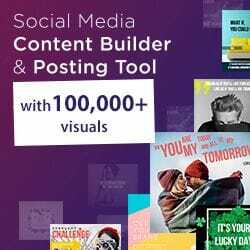 This should also be your preferred method, as it ensures all users have an equally enjoyable experience on your website and are far more likely to convert. …your hotel’s website can look incredible on a desktop computer, but if it looks bad on mobile, it’s not going to be on page 1 in Google. While we were seeing this time and time again, we couldn’t find any useful case studies giving us the statistics on mobile hotel websites and how many are being penalised by Google. We like to use data to back up our decisions, so what better way than to do the research ourselves? What Makes a Hotel Website Mobile-Friendly? requires files that can’t be loaded on certain devices. Which Hotel Websites Did We Test? Using the same methodology as our “Why Is Hotel Website Security So Bad?” post, we wanted a list of boutique, unique, small and typically independently owned hotels. Once we had a large enough sample size (over 1000 hotels) to review, we turned the names into URLs and set about testing them using Google’s Mobile-Friendly Test API (this allowed us to test in bulk rather than one by one). 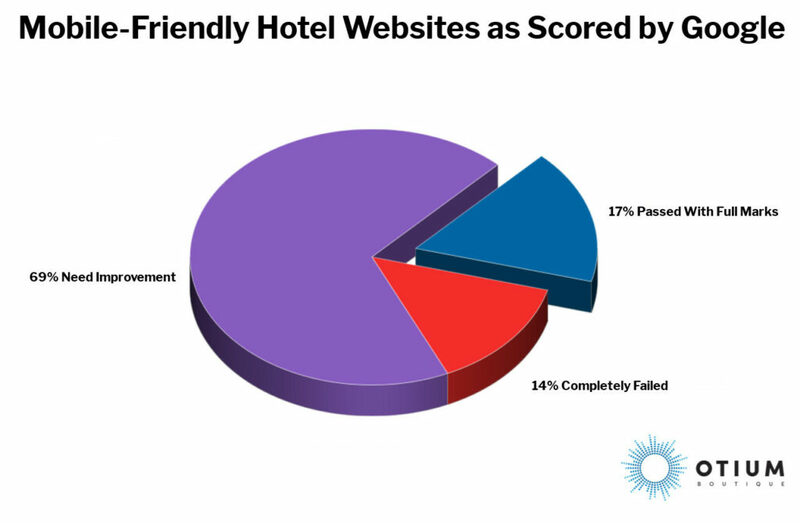 Of the sample hotel websites that we tested, only 17% passed Google’s tests with flying colors. These hotels are getting a free boost in search results from Google and no doubt more direct bookings as a result. 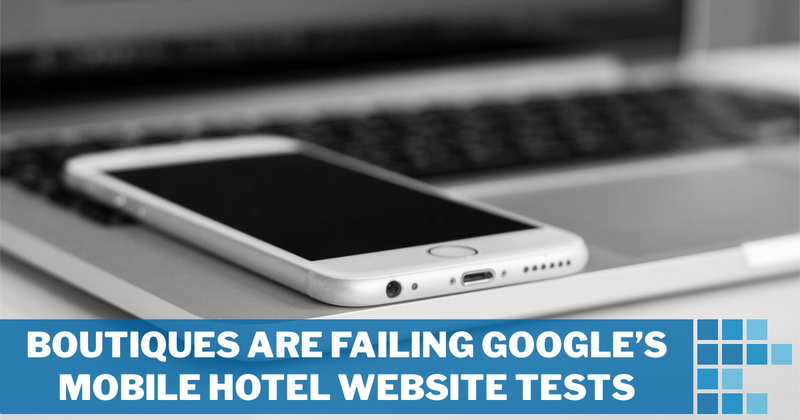 On the flip side, some 14% of boutique hotel websites completely failed Google’s Mobile-Friendly test and have been penalised by Google for users on both mobile and desktop devices, no doubt seeing direct website bookings tumble as a result. More wins for the OTAs! In between however, there’s a large 69% of small hotels that aren’t technically failing mobile-friendly tests but clearly aren’t making life easy for mobile users. Currently, a score of 80 or above is technically a pass from Google, however you can be certain that this will come under heavy scrutiny in the coming months and years. I personally see a great divide between hotels actively pursuing more direct bookings, clawing back revenue from OTAs, and hotel management that has given up in defeat. It certainly appears that some have abandoned their internet presence, and pay the price in commissions. These are brilliant hotels when you are there in person but can be let down by first impressions online. Hoteliers think in “guest experience” – internet marketers like myself think in “user experience”. If your hotel doesn’t have a mobile-friendly website, the first opportunity for you to control a guest’s experience with your hotel is at best a bad experience, or worse – an experience with another hotel! Most likely, the experience is scooped up by your local, mobile-friendly OTA and handled with ease. The memories of convenience and a great user experience are building their brand – not yours. It doesn’t have to be this way, and updating your mobile hotel website doesn’t need to be painful – but the train is leaving the station. Competing hotels and OTAs are getting a stronger foothold each day your site isn’t responsive, and this will only continue as search engines tighten their standards. Need help making your hotel website mobile-friendly? We’d love to help your hotel get more direct bookings online. Contact us today and let us make it easy for you!